Asimov, knighted a Grand Master by the Science Fiction Writers of America, was an eloquent raconteur; in fact, the book reads like a one-sided conversation, as he shares his opinions on surviving Star Trek conventions, other science fiction authors' egos, and, of course, his own career. The bestselling author, famous for creating his groundbreaking Robot and Foundation series, conducts this merry chase in a chatty tone that is energized by his honesty. The same man who dwells on his devotion to his daughter and second wife also shares the discomfort he felt when he saw his first wife at his daughter's graduation. He even reveals that upon meeting Judy-Lynn del Rey, the late editor who would grow to be a dear friend and the inspiration for some of Asimov's award-winning stories, he was repulsed by her dwarfism. 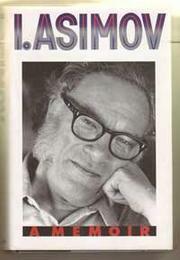 But Asimov's confidences earn our forgiveness. In fact, when he recounts his experiences with publishing houses--especially Walker & Company, Simon & Schuster, and, most of all, Doubleday--one can't help but laugh. Asimov spits no venom at the editors and agents who opposed him, but he never forgot any of their names or power plays either, and one after another is gleefully recounted here. Mixed in with the bons mots and the gossip are true stories about Asimov's novels and short fiction that fans will cherish. Perhaps most gratifying of these is the confession of astonishment Asimov expressed upon reaching bestseller status, late in his life. by William H. Patterson Jr.